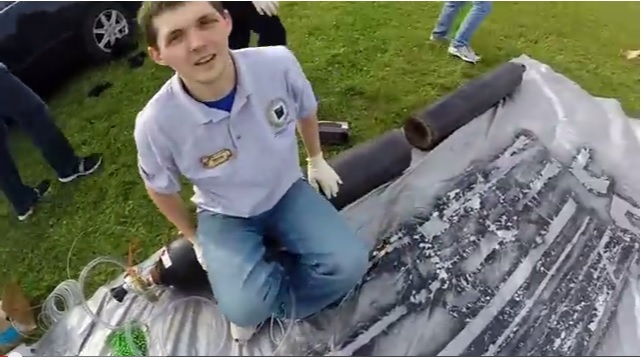 A group of Purdue University students whose camera-equipped weather balloon vanished during the Midwest’s recent tornado outbreak has got their balloon back along with some amazing footage thanks to an Ohio farmer. Purdue technology and engineering students launched the high-altitude balloon the day before Nov. 17’s deadly tornado outbreak. But howling jet stream winds swept it eastward and it crashed in a northeastern Ohio field near the town of Kalida. The storm-tossed balloon also lost its Purdue contact information. But the farmer who found it geared up its camera and saw footage of the students who launched it sporting Purdue sweatshirts. The farmer was able to track down the students, who got their balloon back Monday night along with footage looking down on menacing clouds during the tornado outbreak. “We had placed a handheld APRS radio in the payload. As the balloon gained altitude the temperature drop caused the battery to fail which caused us to lose tracking ability. The battery was fine once we charged it back in our lab. The label got washed away in the heavy rains, it would have been still attached. Next time we are going to laminate the labels .